Post-punk funk from Manchester featuring JEZ KERR, MARTIN MOSCROP, DONALD JOHNSON, TONY QUIGLEY and LIAM MULLAN. 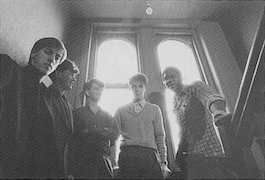 In time, their sound began to include an increased amount of Latin-influences, particularly on the albums "Sextet" and "I'd Like To See You Again", before the band attempted a slightly more commercial approach on the "Force" album, their last for Factory in 1986. Post-Factory releases include two albums for the major-label A&M ("Good Together" and "ACR:MCR"), various singles and albums on Rob Gretton's Robs Records and a selection of compilations and reissues on the Creation, Soul-Jazz and LTM labels, the latter also responsible for releasing a studio album, "Mind Made Up", in 2010.